Located in an area with a stunning view of the Himalayas, Kangana Ranaut's new house in Manali is a swanky mansion worth Rs 30 crore. 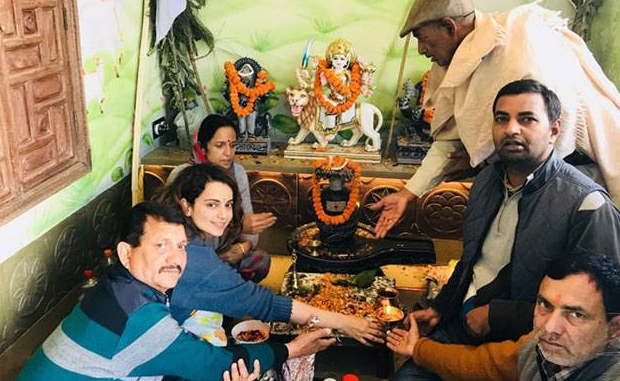 A few months back, Bollywood diva Kangana Ranaut surprised her fans when the news of her building a mansion in her hometown Manali hit the internet. Apparently, Ranaut had bought a piece of land in her scenic hometown in Himachal Pradesh after the success of Queen (2014). The actress had reportedly consulted several architects to design a plush house there. Some reports also said that it took the Queen actress four years to build the swanky mansion. Located in an area with a beautiful view of the Himalayas, the house in the resort town reportedly costs a whopping Rs 30 crores. In an Interview with TOI, the Manikarnika actress revealed, " Around four years ago, it was spontaneous, and I told my parents that I want to make a very small house in Manali and test that feeling... like have a one bedroom and kitchen and see how I feel there. Do I feel a sense of what I am looking for? And I was so busy with my work. And they got this grand project, they saw the land, and I am like, what? You guys spent so much and got this, but I was just testing! And then one thing rolled into another, and my architect came over, and she made this grand house." "The vibration here is so strong, and when they told me there is this temple, I asked which one is this?" said Kangana, "I had read a lot about Kartikeya's mahasamadhi in the Himalayas, and I asked if this is the same place where it took place, and they said yes. And I am like, this is it. This is it. So that was this indication for me. Basically, for me, it's more for a spiritual purpose. And my house is named Kartikeya Niwas, after the temple." She further added. Some reports say the mansion has eight bedrooms with all the windows opening to the view of the mountains. Each room has a step-out balcony and there is a rooftop with a glass conservatory so there is sunlight inside the house. The Queen actress' new home has become a hot spot for tourists and locals, and people have been taking selfies outside her house. Reports say that her neighbors are really excited to have the diva next door and they have been sending her groceries as a goodwill gesture. The actress joined her family for the housewarming ceremony held recently. Here is a picture of the ceremony. According to the TOI, The perks of staying in Manali allow Kangana to step out of her house at 5 am for walks and get back to her house without being mobbed. She has been spending most of her time introspecting, learning how to play piano and looking at the stars through her glass observatory. She goes to have dinner in the evening without the need of a bodyguard, which is just unthinkable for her in Mumbai. Kangana had spent a week in the beautiful hill station, enjoying the winter and snowfall and came back to Mumbai for a few days before she resumed her next schedule of Manikarnika: The Queen of Jhansi in Rajasthan which is slated to release on 27 April 2018.